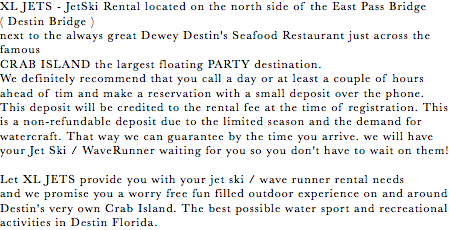 We want to thank all of our customers for the great 2014 season and for making us the choice of your WaveRunner / Jet-Ski and Destin parasail provider and we hope to see you again in the 2015 season. We promise the same great and personal service, the same lowest prices in town, no surcharges or tricks and most of all the best location in town that you all love. Proin non sapien tellus. Proin venenatis consectetur quam non interdum. Quisque nec ligula eros. Vivamus orci massa, facilisis eget pharetra id, aliquam ut tellus. Maecenas dapibus blandit tortor at tincidunt. Donec congue, nisl non interdum imperdiet, magna augue commodo augue, eu fringilla augue quam at eros. The waverunners / jet skis are all 3 seaters (Do not exceed 450 lbs.) All drivers must have a photo ID. You must be 18 years to rent and 16 to drive/operate a waverunner or jet ski with a boaters license. Under 18 must have a parent or guardian rent the waverunner or jet ski. Travelers must be 23 years of age to operate wave runner or jetski alone. the FWC temporary boaters' license test at our location. The test cost $3 and takes approx. 10 min. Or present a current Boaters Safety Course completion card. This course can be taken online and printed out before your trip to XL Jets in Destin. You will be required to listen to the safety rules. We provide all safety equipment including life jackets. family owned seafood restaurant owned by the Destin family. where you can watch the dolphins play while you having dinner. Dewey’s great, great grandfather, Leonard Destin, founded the town in 1835. It is no surprise that you will have a lot of questions, especially if you have never experienced parasailing before. Here are some short and fast answers to some of our most frequently asked questions. More in depth answers can be found by contacting us at your convenience. 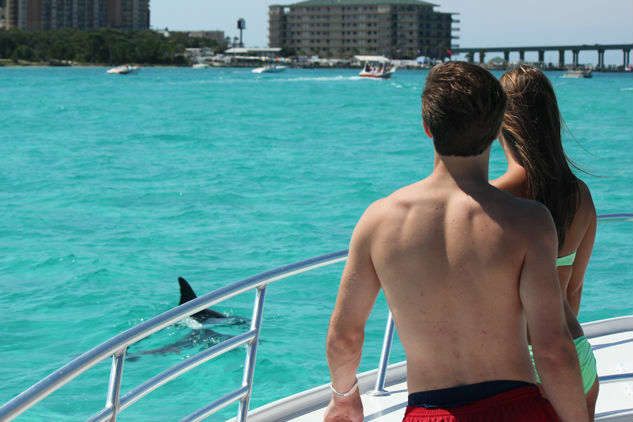 If you are ready for an amazing parasail in destin Florida or even waverunner rentals in Destin, Jet skis Destin, Pontoon Boat rentals Destin Fl, Xtreme H2.O Is the place to be!